Centered on the longstanding Green Bay Packers tradition of players riding kids’ bikes to and from practice during training camp, American Family Insurance will unveil its new DreamDrive program when the Packers open training camp on Saturday, July 26. A ribbon cutting ceremony is scheduled for 7:30 a.m. CT prior to the Packers’ first practice at 8:20 a.m. The quarter-mile route between Lambeau Field and Ray Nitschke Field – the team’s practice facility – will officially be known as DreamDrive, on which Packers players will interact with fans as they make their way to and from practice via bicycle. In addition to the bikes kids bring to training camp, DreamDrive will feature five custom three-wheeler bikes known as “The Dream Fleet,” which kids and Packers players can ride. Children chosen by a Green Bay area non-profit will be honored as the inaugural DreamDrive participants prior to Saturday’s practice. For the remainder of camp, The Dream Fleet will become part of a bike share program for kids in attendance. While no one is exactly sure when it started, Packers players have been riding kids’ bikes during training camp for more than half a century. The tradition is believed to have been originated in the early 1960s during Vince Lombardi’s tenure as coach. • Adjacent to DreamDrive will be the American Family Insurance DreamZone, located inside the revamped Tundra Tailgate Zone. The DreamZone will operate during the first week of training camp and will feature inspirational and engaging activities centered on the pursuit of dreams. Activities inside the DreamZone will include football toss, photo opportunities, the Lambeau Leap, interactive trivia games and more. • Packers Head Coach Mike McCarthy will host a 30-minute question and answer session with fans in the DreamZone at approximately 11:30 a.m. following Saturday morning’s practice. Attendance at the Q&A will be determined on a first-come, first-served basis. • For a complete list of Packers training camp activities and events, click here. GREEN BAY–Mason Crosby would seem to be on the verge of retaining the job he’s held since 2007. In a two-bout, high-stakes kicking competition in Tuesday’s practice at Ray Nitschke Field, Crosby converted all 14 of his field goal attempts. The distances in round one ranged from 33-58 yards and the kicks were into a light wind. In round two, the distances ranged from 35-64 yards and the kickers were downwind. Challenger Nick Ramirez was a combined six of 16, four of seven into the wind and two of nine downwind. He was afforded two extra kicks — both from 58 yards — in the downwind round, and failed to convert either one. Tuesday’s practice, on possibly the hottest day of training camp, is the last of camp and must be followed by a roster reduction to 75 players by late this afternoon. Packers.com will provide a full report following practice. For more on Tuesday’s camp-ending kicking competition, click here. On Monday, Head Coach Mike McCarthy talked about the decision to release K Giorgio Tavecchio and what that might mean going forward, while QB Aaron Rodgers recapped the Packers’ preseason thus far. 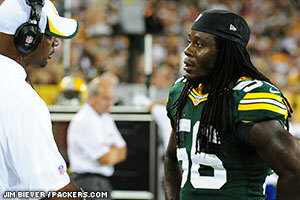 –Highly questionable call: McCarthy isn’t going to tell LB Terrell Manning to do anything different next time. In the fourth quarter of last Friday’s preseason game vs. Seattle, Manning blitzed Seahawks QB Brady Quinn and drilled him, shoulder to chest, as he released the pass and the two crashed to the turf. Manning was then flagged for roughing the passer, with the official explaining that Manning brought his weight down on Quinn at the completion of the play. McCarthy doesn’t agree, at all. “I thought Manning’s hit on the quarterback was textbook,” McCarthy said on Monday. “Frankly, when the quarterback jumps in the air and the linebacker is blitzing, and he hits him with the shoulder and so forth, I don’t know how you don’t have a weight-bearing issue. I think (the problem is) the way the rule is defined and written as opposed to the intent of it. Manning was visibly upset with the call at the time, but to his credit, he kept his composure for the most part. The penalty came on third-and-8 and gave Seattle a first down, but three plays later the Seahawks punted anyway. “At the end of the day, I had to move on quickly because when I’m out there, I’m the signal caller, so I have to get my defense lined up and ready for the next play,” said Manning, who said he hasn’t heard from the league about any possible fine. “Of course I was a little shocked and displeased, but I have to have short-term memory out there to make sure the team is ready to go. McCarthy often has expressed confidence in the league’s efforts toward player safety, but the application in this instance didn’t take all the circumstances into consideration. 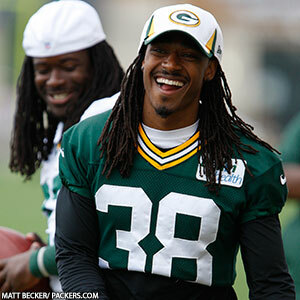 –Williams back to work: CB Tramon Williams practiced on Monday for the first time since the first padded practice of camp, which was back on July 28. He’s been nursing a painful bone bruise on his knee since then, but he tested it out in a limited number of snaps in Monday’s no-pads practice, and the early reports were good. Encouraging enough for Williams to feel better about his chances of making it all the way back for the season opener at San Francisco, but as has been his approach, no guarantees. –More on injuries: McCarthy ruled out LB Brad Jones (hamstring) from Thursday’s game in Kansas City, having already done so with S Morgan Burnett and CB Casey Hayward, who also have hamstring injuries. Rookie WR Kevin Dorsey (toe) and LB Dezman Moses (toe) did not practice on Monday. RB DuJuan Harris (knee) is getting a second opinion on his injury, so there’s no definitive update on his situation. –Smooth it out: The backup center position has been a rough spot through much of training camp. Early on, Don Barclay was having QB-C exchange issues before moving back to tackle full time, and lately Greg Van Roten and Patrick Lewis have struggled with some shotgun snaps. Van Roten is the leader for the backup job but rolled another shotgun snap back to the QB in practice on Monday. Due to the rainy weather, Monday’s training-camp practice scheduled for 11:30 a.m. will be moved indoors to the Don Hutson Center and be closed to the public. Players will not be riding bikes to practice. The Packers have one more practice open to the public, scheduled for 11 a.m. Tuesday at Ray Nitschke Field. 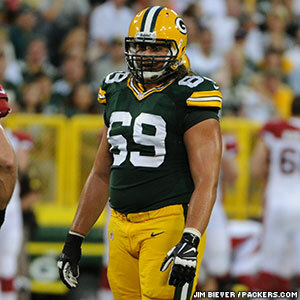 On Sunday, Head Coach Mike McCarthy explained the team’s decision to release QB Graham Harrell, which can be found here. A third kicker was also added to the competition, and you can read about his strong first impression here. –Nelson, Cobb back to work: WRs Jordy Nelson (knee) and Randall Cobb (bicep) were back on the practice field on Sunday, a good sign that the Packers WR corps could be at full strength for the season opener in San Francisco. Both players ran routes during a lengthy jog-thru period and did some conditioning work after. Neither receiver has played in a preseason game yet, so Thursday in Kansas City would be the last opportunity, but that isn’t taking paramount importance. “I don’t think it’s going to matter, because if I do play, it’s not going to be much,” Nelson said. “I think that little bit of work is not going to make a difference if I get it or not, but we’ll see. Cobb is taking the same approach. Wearing a compression sleeve on his injured right bicep, Cobb said he will play “free-minded” and not have any worries about the injury when he’s out there full time. –Banjo making roster bid: Rookie S Chris Banjo, who went undrafted out of SMU, is making a bid for the No. 4 safety spot on the roster with his heads-up play on both defense and special teams. In last Friday’s game in Seattle, Banjo made an impressive tackle of TE Luke Willson just shy of the first-down marker on third-and-5, forcing the Seahawks to punt. Later, he brought down former Packer Will Blackmon on a punt return. There’s no guarantee the Packers will keep four safeties, but starter Morgan Burnett sustained a hamstring injury last Friday, which could force the Packers to go deeper at the position, increasing Banjo’s chances. Banjo has been working against the odds from the start, arriving four days into camp after being released July 25 by Jacksonville. Injury update: Of the players injured in last Friday’s game, McCarthy said Burnett (hamstring) and CB Casey Hayward (hamstring) would not be available this week. LB Brad Jones (hamstring) could be back sooner than the other two. RB DuJuan Harris (knee) and CB Jarrett Bush (ankle) also missed practice, while TE Matthew Mulligan (elbow) returned. CB Tramon Williams (knee) would not rule himself out for Week 1 in San Francisco, but he wasn’t guaranteeing he’d be ready, either. –On target: QB Aaron Rodgers has done it many times before, and he did it again on Wednesday. Launching throws from long range toward a netted hoop near the sideline, Rodgers dropped one in from around 40-50 yards away, drawing cheers from the Ray Nitschke Field crowd, which got to see an exaggerated “belt” celebration from Rodgers. For a video of Rodgers throwing a deep ball into the hoop earlier this training camp, click here. As for the rest of practice, Rodgers said he feels fine after missing Tuesday’s workout due to a head cold. Acknowledging the starters may not play the entire first half like they normally would in the third preseason game, Rodgers said that won’t impact the team’s readiness for the regular season. –Time to catch up: WR Charles Johnson, a seventh-round pick from Grand Valley State, says he’ll be ready to play as soon as the coaches decide to put him in a game, despite the fact that he has hardly seen the field. Johnson got hurt on the second day of OTAs, returned for the first two training camp practices without pads, but then had not practiced since until Wednesday, when he was very limited but in full uniform. It would seem awfully soon for Johnson to play on Friday after just one limited day of practice, so his roster fate could very well come down to the fourth preseason game, at Kansas City next week. But he’s willing to take any snaps the coaches want to give him, even if it’s right away Friday night. –More on injuries: Undrafted rookie LB Andy Mulumba (knee) missed practice on Wednesday, while CB Loyce Means (ankle) was back in action. –Play of the day: TE Brandon Bostick made the play of the day, leaping between two defenders in the end zone with one arm reaching straight up, tipping the ball to himself and then hauling it in as he fell to the ground. –Constant reminder: S M.D. Jennings isn’t thrilled with his current fate, which is being forever connected to last year’s “Fail Mary” on the final play in Seattle. He can’t escape reminders of it wherever he goes, though he’s always a good sport about it and has signed autographs of the famous end zone picture when asked. Of course, the reminders are back again this week with the Seahawks coming to Lambeau Field for a preseason game. “All the time,” Jennings said of how often he’s reminded of last year’s Week 3 contest. “It’s something that’s stuck with me unfortunately. It’s something I’m trying to get over. I don’t want to be remembered by that play. I just try to go out there and play football. More important to Jennings, he’s trying to lock down the starting safety spot opposite Morgan Burnett. He’s been competing with Jerron McMillian throughout the preseason, and based on the way the reps with the first unit are being distributed in practice, Jennings is in the lead for the starting job. He’s taking nothing for granted, though. Any talk of what he’s working to improve on always comes back to the basic fundamentals. No matter who wins the starting job, both Jennings and McMillian are expected to play from scrimmage in the various defensive packages. Neither has made any standout plays in the preseason yet, but two games still remain. –True contender: Mike McCarthy said earlier this week that rookie CB Micah Hyde would get an opportunity to return punts, and he was the returner taking the first rep on Tuesday. Hyde had a 13-yard punt return last week in St. Louis and could make a strong bid for the job with a good showing against Seattle. –Injury update: The only changes to the injury list were that CB James Nixon (ankle, knee) returned to practice, while CB Loyce Means (ankle) was sidelined. –Finley fans: TE Jermichael Finley makes a big play or two in practice every day, and Tuesday was no exception. Finley continues to beat defenders down the middle of the field and on crossing routes, providing a steady target for whichever Packers QB is throwing the ball. QB Vince Young, a teammate of Finley’s for one season at the University of Texas, said more than once that he’s proud of the former Longhorn, who came into the NFL two years after Young did. The knee issue is something that first cropped up for Nelson during his college days at Kansas State, and he has dealt with it in his pro career, but he said it’s never been a constant thing. That’s why he never had the surgery until now, when it cropped up after one week of training camp but five weeks before the first game. “You want to avoid surgery as much as possible,” Nelson said. “That’s what we tried to do. We thought we had it taken care of, and then we realized we didn’t. Nelson added that had the flare-up occurred during the regular season, he would have been able to play through it, but with the timing it made sense to go this route. –Extra attention: No one has distinguished himself as the clear No. 2 QB, but Mike McCarthy feels no matter who wins the job, the Packers will be better off for having brought in Vince Young. Coleman has been the fourth QB in the rotation in the first two preseason games, but McCarthy complimented him for making “a hell of a play” on his TD pass in St. Louis, the Packers’ only TD of the preseason thus far. On the play, Coleman scrambled to his right to buy time and then fired a strike at the front pylon of the end zone to undrafted rookie TE Jake Stoneburner, who was coming back hard for the ball. The score capped a 13-play, 75-yard drive. –No interest in spectating: Rookie DE Datone Jones said he “hates” watching practice, even if it was just for one week with a bum ankle, in part because it reminds him of when he missed an entire college season due to a broken foot. 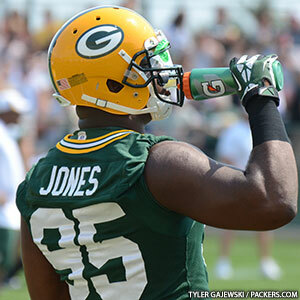 “It ate at me,” he said of then, and now, after Jones returned to practice on Monday. He said he knew right away this injury wasn’t as bad as the college one, though, so he wasn’t overly anxious about it. It came on his very first snap in the first preseason game, when he was tripped by an opposing Arizona offensive lineman on his way to the QB. –New duties: Rookie CB Micah Hyde returned his first punt of the preseason on Saturday in St. Louis, darting and dodging his way for 13 yards up the middle of the field. McCarthy said he’s going to give Hyde more punt-return opportunities this week, and Hyde says he’s ready. Hyde returned punts his final two seasons in college at Iowa. He recorded 13 returns for 68 yards, with a long of 27, in 2012, and he had 13 returns for 108 yards, with a long of 30, in 2011. –Bakhtiari new to domes: It’s just the preseason, but rookie LT David Bakhtiari will get his first taste of playing football in a dome on Saturday night in St. Louis, and that could be important. As usual, the Packers piped in crowd noise during the week of practice for many of the team (11-on-11) periods to work on their silent count. The experience, even if it’s only loud for the first series or so and won’t be as loud as it would be in a regular-season game, could be valuable for Bakhtiari because the Packers have three regular-season dome games this season — at Minnesota, Detroit and Dallas. –Youth in secondary still shining: Rookie CB Micah Hyde made yet another big play in practice on Thursday, leaping at the goal line to intercept a pass that was intended for a receiver running a crossing route in the back of the end zone. It wasn’t as spectacular as the interception Hyde made on Wednesday (click here and scroll down to the “Plays of the Day”), but it was a pretty nifty play nonetheless. With CBs Tramon Williams (knee) and Casey Hayward (hamstring) still sidelined, Hyde likely will start on Saturday night. Mike McCarthy noted how strong an impression Hyde made when he first arrived in Green Bay for rookie orientation. The coaches were firing punts and kickoffs out of a Jugs machine to numerous players and various places on the field, testing the rookies’ abilities to track down the ball and catch it in difficult spots. Hyde, a fifth-round draft pick, stood out during the drill. Another young defensive back who made a big play on Thursday was rookie S Chris Banjo, who intercepted a pass in the end zone intended for TE Brandon Bostick. Banjo wasn’t signed until three days into training camp but is making a bid to stick around in some capacity. “It’s everybody’s responsibility,” Jones said. “Everybody in here is a man. You’re not in college no mre, you’re not in high school no more. When you make a mistake, you have to own up to your own mistake. –Injury update: In addition to the injury updates provided in today’s main story, OL Andrew Datko returned to practice from a concussion. He had been out since late last week. 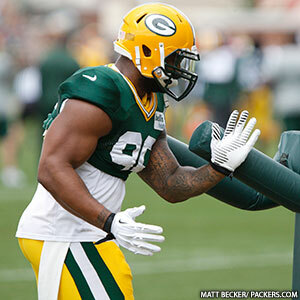 –Neal flashes in new role: He missed time early in camp due to an abdominal injury and sat out the first preseason game, but DE Mike Neal is starting to look more comfortable in his new hybrid lineman-outside linebacker role. On Wednesday, Neal was showing up in a number of drills, including the OLB-RB blitz pick-up and the one-on-one pass rush, where he worked from both inside and outside. He also stuffed one running play in team (11-on-11) work and was a factor at the line of scrimmage on a number of other snaps. Neal is taking a liking to the hybrid role now that he’s had more time to absorb the responsibilities of the OLB position, a process that began in OTAs. The next step will be to carry the kind of impact he had on the practice field on Wednesday into the preseason game in St. Louis on Saturday, which he said he’s definitely looking forward to. –Young to get more plays: McCarthy said he’s seen a lot of progress in QB Vince Young now that he’s been in camp for a week, and he plans to get Young more snaps with a larger play selection in Saturday’s game. Young took a number of snaps in the team drills on Wednesday and appeared to be getting the ball out of his hand faster on pass plays, an indication he’s understanding the scheme more and more. –Injury update: WR Randall Cobb (bicep) and RB James Starks (illness) sat out practice, while G T.J. Lang (back) returned and TE Ryan Taylor (knee) was back on the field for the first time since the Family Night scrimmage. DE Ryan Pickett also returned after missing a day for personal reasons. RBs Eddie Lacy and DuJuan Harris were cleared for more contact, with Lacy doing more in the team drills than Harris did. Lacy didn’t appear to have any issues with his hamstring, but he stopped short of saying he would for sure have clearance to play on Saturday in St. Louis. Both Lacy and Harris missed the first preseason game last week. –Plays of the day: Two of the rookie stars thus far in camp have been undrafted WR Tyrone Walker and fifth-round CB Micah Hyde, and the pair made two of the highlight plays in practice again on Wednesday. Walker made a nifty tip-toe catch right at the front pylon of the end zone on a throw from QB Graham Harrell after Harrell scrambled to his left to buy extra time. Then, moments later, Hyde was in coverage on a fade to the corner of the end zone to WR Myles White. With his back to the ball, Hyde turned his head at just the right time to see it and deflect it. As he fell to the turf, the ball then hung on Hyde’s hip and he was able to tip it back to himself, make the interception and get up to run. The grab looked similar to Antonio Freeman’s “Monday Night Miracle” against the Vikings in 2000, only it was a great defensive play rather than an offensive one.